For $17,000, Is This Cherokee A Super Chief? What was once old is new again, and in the case of today’s Nice Price or Crack Pipe Jeep, its been brought back supposedly better than ever. Still, will its price prevent this Cherokee from being part of a new owner’s future? With its 66% Nice Price win, yesterday’s tidy 1987 Dodge Charger proved that old maxim that there’s nothing better at solving life’s little problems than cubic inches. Much like that reimagining of an older car into something new and different, so too does today’s candidate attempt to meld classic and modern elements. It's sort of like autotuning Puccini! Yes I know, another week another Jeep, but this one is far more modest in appearance, and lightyears more rational than last week’s batshitcrazypants adventure. 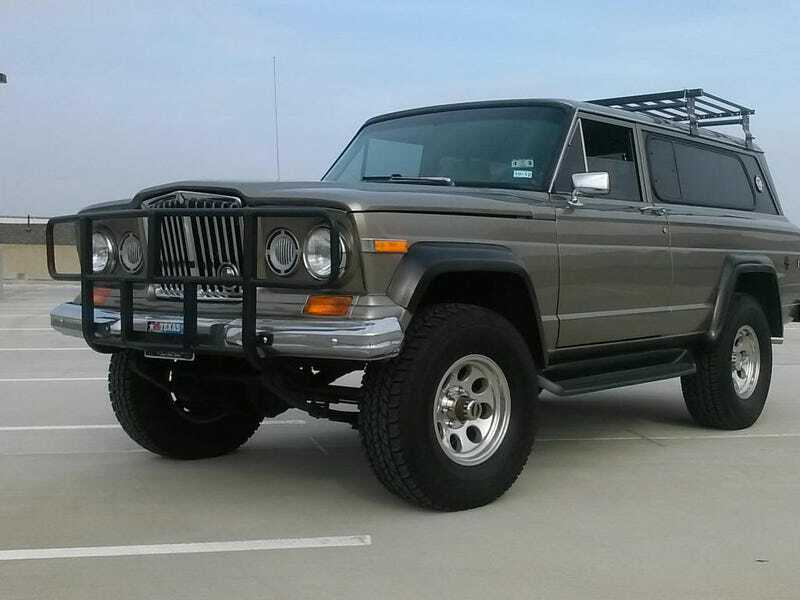 Instead, this 1979 Jeep Cherokee Chief has, according to its seller, been “resto-modded,” That means that certain elements of the model’s past glory have been retained and enhanced, while other aspects that might not have successfully made the transition to modern usage have been given the heave-ho and replaced. Overall the two-door wagon appears as clean as a bean and features not the ’79’s “Pig Nose” grille, but the “Rhino” clip from the earlier Brooke Stevens-designed Wagoneer. That gives the truck somewhat the appearance of a very butch Jaguar 420. The ad says that it was taken to the metal before being coated in Wrangler Light Khaki Metallic, and both the paint and the extensive chrome look pretty damn nice. This being a Texas truck there’s also the expected Gun Rights bumper sticker on the DrawTite, but that’s the only thing stuck on, and in fact the roof rack has been replaced with a unit that clips to the drip edge eliminating the leaky mounting holes in the lid. The Chief package added wide-track axles and requisite flared fenders, which are here painted in tough guy black. On the inside, this Jeep is a melange of old and new. The stock dash and wheel are joined by a center console out of a modern truck and what look to be low-end BMW seats. The bench in the back has been covered with something that makes it look like it’s out of that show Dexter, but overall the insides seem a nice place to be. Mechanically, the Cherokees originally had a lot of GM in them, using that company’s steering column and on occasion their THM400 automatic. This one takes that relationship and invites over the in laws with the addition of a 5.3-litre Vortec V8 and 4L60E that were both yanked from a 2003 Tahoe. That engine was good for 285-bhp, and 325 kb-ft of torque from the factory. That's a good bit more than the 175 ponies that were available in the top 360 back in ’79, which was a 2bbl. The mondo 401 had been dropped the year prior. In addition to the new mill and 4-speed autobox, this Jeep gets an aftermarket A/C so it’s R134 complaint, and an NP241 two-speed transfer case to send power to both ends. The original 15 gallon gas tank has also been replaced with a 40 gallon wallet emptier that probably could also serve as a lap pool in a pinch. Considering all the work that has gone into this Jeep it’s a bit concerning that it is now being sold with “a few little things left to complete.” The seller does say that it has been on the road without incident, to the tune of 19,000 miles since the build was done. No word on how many miles were on the drivetrain before it was drafted into Jeep duty however. If you happen to have a look at what fully restored Wagoneers are going for today - not just asking but actually selling - you might just Rubicon your Fruit of the Looms. The four-door wagons are apparently hip to be square these days, and can command some pretty big bucks. The two-door Cherokee, even as a Chief, seem to be a little less desirable, but that doesn’t mean this one doesn’t come with a pretty hefty sticker. The seller is asking $17,000 for his truck, and as always, the vehicle in its present form couldn’t be replicated for its asking. The question for you, of course, is whether anyone would want to. This is a pretty killer Jeep, but seventeen large will buy a lot of other things. What do you think about this resto-mod Cherokee and its $17,000 price tag? Is that a deal, or does that price make this a resto-development? Denver Craigslist (although the Truck's in Texas), or go here if the ad disappears. H/T to Bignlockbear for the hookup!